Saturday evening’s blustery weather didn’t deter about 100 people from gathering at the Village at Leesburg to see one of the area’s largest trees lit up, marking the unofficial start of the holiday season. 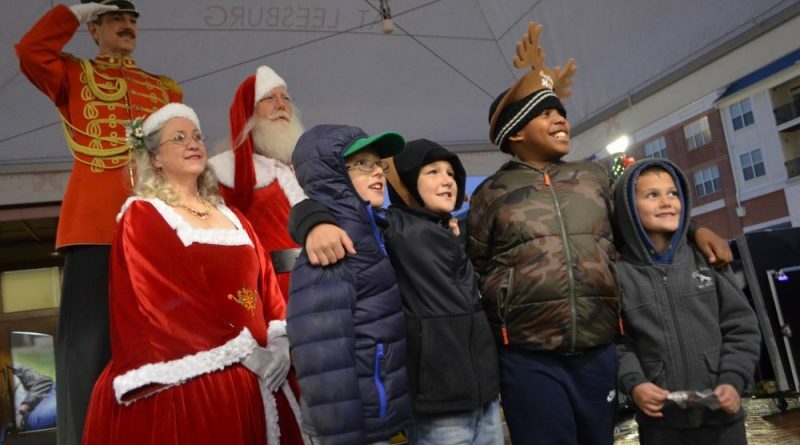 The tree lighting ceremony featured horse-drawn carriage rides, caroling, and appearances from Santa, Mrs. Claus and a toy soldier on stilts. Families huddled around a fire in front of Travinia Italian Restaurant to stay warm during the event. Others watched the tree lighting from indoors, peering through the storefront windows. The animated tree will light up and play music daily at the top of the hour from noon to 9 p.m. through Christmas. Learn more about other holiday events at the Village at Leesburg at villageatleesburg.com.